Train to be a manager, owner or supervisor in a Production Nursery. This course is for anyone who works in the wholesale or production nursery industry, or a manager or supervisor in an unrelated industry, who is looking for a career change. This course develops an understanding of plant propagation (seed and cuttings), nursery hygiene, plant health, potting mixes and soils, production efficiencies, marketing, management, and more. 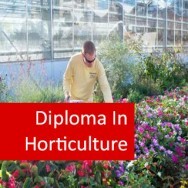 This is an 800 hour covering both management and horticultural studies relating to running a wholesale nursery. You will be required to complete the four core modules, the two stream modules and two elective modules from a choice of twelve. 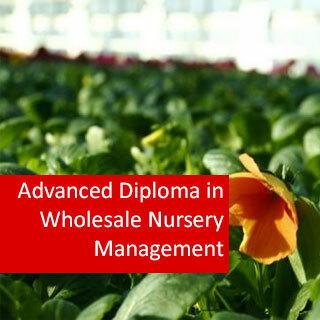 Core Modules: These modules provide foundation knowledge for the Advanced Diploma in Applied Management - Wholesale Nursery. Click on the links to see what each module will teach you. Note 1: Each module is a short course in its own right, and may be studied separately. Bare Rooted - These are plants that have been 'lifted' from their growing area without the soil or growing media left around their roots. This is common for many deciduous ornamental trees (eg: elms, ashes, maples) and fruit trees (eg: apricot, apple, peach, pear), and shrubs such as roses. The plants should be planted as soon as possible to prevent the roots drying out. They can be temporarily stored if the roots are covered with a moist material such as peat moss, straw, or rotted Sawdust. Bedding Plants -These are plants used for temporary displays, generally planted out in warmer seasons (eg: many annuals). Bottom Heat - This is where heat is applied at, or near, the base of plants to stimulate growth.This can be done in a variety of ways, including under bench heating with heat cables or hot water pipes, heating of floors in greenhouses using heat cables, or composting materials such as sawdust or manures. (See also Hotbed). Coldframe -This is in effect a mini-greenhouse. Generally unheated, they are commonly used to provide protection for plants being propagated, or for plants that may need a short period of protection against extremes of climate. They have the advantage of being readily movable, and easy to construct. Dibble Stick - This is a short pencil-like stick that is used to make holes in growing media for the potting-up ('pricking out') of seedlings, or for inserting or potting-up cuttings. Flats - These are shallow trays with drainage holes in the bottom, which are commonly for germinating seeds, or rooting cuttings. Forcing - The use of heat and altered light conditions to induce very early flowering, or very tall growth. Commonly used in cut flower production. Growing Media - Any material in which plants are being grown can be classified as a growing media. This includes soil, soilless potting mixes, rockwool, vermiculite, even water (ie: hydroponics). Hotbed - This is a bed used for plant propagation that provides heat to the base of seed trays or to pots of cuttings to stimulate germination in seedlings and subsequent root growth, and root initiation and growth in cuttings. Heat is normally supplied From either hot water pipes, or from resistance cables which, when an electric current is passed through them, heats up. These heating elements generally have some material such as propagating sand, vermiculite, gravel or perlite placed around them to help spread (diffuse) the heat. Juvenility - A stage of a plants life following the germination of a seed to produce a seedling. Vegetative growth dominates, and juvenile plants can't respond to flower-inducing stimuli. In some plants juvenile foliage differs markedly from adult foliage (eg: some Eucalypts). In difficult to root plants taking cutting material from stock plants in a juvenile phase will often give better results than using older (adult growth phase) material. Living Colour - Plants cultivated to provide colourful displays (ie: foliage, flowers, fruit). These can be either in ground or in containers, and be grown for either short or long term display. Micropropagation - This is the production (propagation) of plants from very small plant parts, tissues or cells. They are grown under aseptic conditions in a highly controlled environment. The term tissue culture is a collective term used to describe a number of in-vitro procedures used in culturing plant tissue, including producing haploid plant cells and artificial hybridisation. Plugs - These are individual plants, or small clumps of plants, that are grown in trays containing large numbers of individual cells. For example, the tray may have 18 cells across by 32 cells along, making a total 576 cells per tray, with each individual cell having measuring 20 x 20mm and with a depth of 30mm. Each cell having an individual drainage hole. The trays are filled with a growing media and seed planted into each cell, either by hand (very slow) or by machine. There are machines that are capable of planting individual seeds into each cell, and very quickly. The trays are made of plastic, that has some degree of flexibility so that it can be bent a little to allow easy removal of individual plugs (root ball and growing media combined). This type of growing system, is ideal for flower and vegetable seedlings, and can be highly mechanised (eg: filling trays with soil, seeding, potting up individual plugs). Potted Colour - Plants grown in containers to provide a colourful display. They are commonly used as an alternative to cut flowers (eg: Chyrsanthemums in 150mm pots), and are generally discarded once their peak display (eg: flowering) has finished. Provenance - This is also known as 'seed origin' and refers to where the seed has been produced. This can give an indication of the particular genetic characteristics of the seed (eg: size, shape, flower colour, adaptation to climatic conditions, resistance to pest & diseases, tolerance to different soil conditions). Scarification - This is any process that breaks, scratches, cuts, mechanically alters, or softens seed coats to make them more impermeable to water and gases. Techniques include dipping in hot water, dipping in concentrated sulphuric acid, removing hard seed coats with sand paper, and nicking seed coats with a sharp knife. Standards - These are where plants are grown a single tall stem (eg: some fruit trees and roses). Some prostrate cultivars are also budded or grafted onto taller stemmed rootstocks to create pendulous forms (eg: weeping elm, Grevillea gaudi-chaudi & Royal Mantle). i) plants growing in parks, around houses, in the wild, etc. ii) prunings or trimmings from young nursery plants, and iii) plants grown specifically as a scource of cutting material. Stock plants should be correctly identified (and true to type), and in a healthy condition. Stratification: This is where dormant seeds, that have imbibed water, are subjected to a period of chilling to 'after-ripen' the embryo. This process is also known as moist-chilling. Dry seeds should be soaked in water prior to stratification. Seeds are then usually mixed with some sort of moisture retaining material, such as coarse washed sand, or peat or sphagnum moss, or vermiculite. The material should be moistened prior to mixing. The mix is then stored at a temperature of 0 - 10 degrees C. The lower shelf of a domestic refrigerator is usually suitable. The time of stratification will depend on seed type, but usually 1 - 4 months. In areas with cool winters, stratification can be carried out in beds outdoors, but seeds should be protected from pests such as birds, or mice. Australia has an upper diameter of 50mm, a depth of around 70mm, tapering down to a lower diameter of about 40mm. This type is most widely used in producing stock for planting up into larger containers. Deeper tubes are also commonly used for tubing-up quick growing seedlings that are to be used in large scale plantings (eg: reafforestation, farms, trees). Some nurseries specialise in just tubestock production for sale to other nurseries, for growing on. Tubestock: Plants grown in tube-like containers (see Tubes above). Wounding: Root production on cuttings can often be promoted by wounding the base of cuttings. A common method of wounding plants is to cut away a thin strip of bark, about 1.5 to 3cm long (this will depend on the size of the cutting) from each side of the cutting near the base. The strip should not be cut too deeply, just enough to expose the cambium layer (the soft layer of new growth between the wood and the bark), without cutting very deeply into the wood beneath. Throughout this course, you will have engaged and interacted with people in the nursery industry, including tutors and others. You will have begun to build your networking within the industry; and often our students will already be working in the nursery industry before they complete their studies. For some, you may have already become involved with the industry before you started studying. On graduating; you will have more knowledge, skills and contacts than ever before. You will have opportunities to move forward in many different ways. You may seek start up your own wholesale nursery. Some will continue with studies to an even higher level; and others will build on their studies through experience. marketing education or media - providing services or products in support of the nursery industry. Comparative Credits Information UK Course Credits: 80 - U.S. Credit Hours: 27 - when compared to regulated courses.